Firemint is taking flight and landing on your iPad with its exclusive new Flight Control HD app. 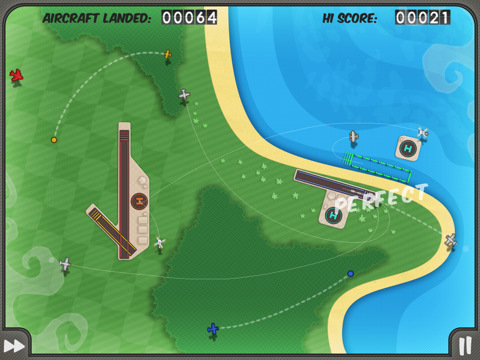 After starting a tidal wave and basically inventing a new genre of line drawing games, Flight Control HD is now bringing its classic strategy gaming masterpiece onto your beautiful shiny iPad screen. If you’ve never heard of the game, you play the role of a traffic air controller who must make sure a slew of incoming planes land their tin cans safely. What will you get with the HD iPad optimized version? Lots of the same gameplay with a bunch of new ways to play them, including multiplayer, versus mode, new airfields, sharper graphics, and a better soundtrack. Thanks to the large iPad screen you can even play with your buddies on the same iPad simultaneously. All this is also reasonably priced at $4.99 which will most likely help Flight Control HD soar to new heights on the iPad. – 2 player multiplayer with Wi-Fi network & Bluetooth. – Multiplayer on the same iPad means you can have 2 people drawing lines on the large screen. 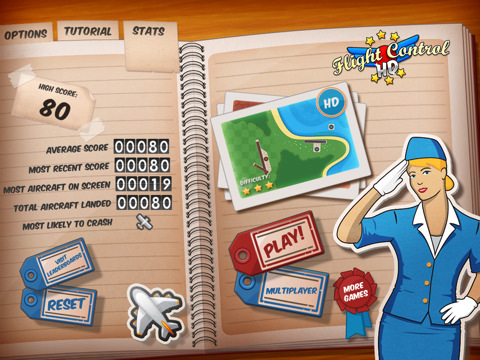 AppSafari review of Flight Control HD was written by Joe Seifi on April 2nd, 2010 and categorized under App Store, Featured, Fun, Games, iPad apps, Line Drawing. Page viewed 6367 times, 1 so far today. Need help on using these apps? Please read the Help Page. One of my all time favorite games, Flight Control is such a solid app. I’m looking forward to getting the Nintendo DS version.